Stand with youth being criminalized, let’s put CPS on trial and help hold them to a higher standard for our families and youth! #CPSonTrial #LoveTheYouth #TheFightsNotOver till all the #youthAreFree! As a part of our collective campaign against racist systems that oppresses our youth, We are asking folx to join in helping support the youth currently on trial for the Jungle Shooting that occurred in Seattle a few years back. They have minimal if any support from community and are feeling isolated as they are facing this system by themselves. These youth have been subjected to structural violence by state sponsored systems all of their lives, yet now they sit facing a lifetime of imprisonment while the state remains unaccountable. This is why it is our duty to stand with them and show up. Where the state fails, the community must build. These youth have been through a lot and and deserve better. Let’s provide them with some encouragement by letting them know we are here with them. With the uncertainty of their future at hand, any support will help boost their morale. This can come in the form of presence at court, video or physical visits, letters, funds for commissary and phone, or just thoughts and prayers. For the sake of their privacy, please contact Asian Pacific Islander Cultural Awareness Group or Xing Hey for further details if you want to support them in any manner. This past June, a group of nine activists shut down 2nd Avenue in Downtown Seattle, in front of the regional headquarters of ICE. This protest – which blocked S…econd Avenue for three hours – has put 1000 2nd Avenue, an otherwise nondescript downtown building, on the map as the nerve center for ICE’s violence in our region. The building has since been the site of relentless protest, as people here and across the country call to abolish ICE. I’m writing because last week, the Seattle City Attorney published an op-ed indicating he intends to prosecute the Anti-ICE 9. He has already filed charges against the climate defenders shut down the street in front of Chase Bank (a financial backer of the Trans Mountain tar sands pipeline) this past May. It’s not too late to stop these prosecutions, and invite Pete Holmes to be on the right side of history. Please call, e-mail, and tweet at Pete Holmes TODAY to ask him to stop the prosecutions. Please share this e-mail with all of your contacts and urge them to make calls as well! Call scripts, sample e-mails, and sample tweets, below! Hello my name is ______________, [and I’m a Seattle resident (if applicable)]. I’m calling to urge Pete Holmes not to prosecute the Anti-ICE 9. They are activists who were arrested on 2nd Avenue on June 5th for protesting ICE. ICE is functioning as Trumps police force, carrying out his racist agenda. If Holmes uses city resources to prosecute the people who are courageously confronting ICE and Trump, he will be on the wrong side of history. Subject line: Don’t prosecute the Anti-ICE 9. I’m writing to urge you not to prosecute the Anti-ICE 9. They are activists who were arrested on 2nd Avenue on June 5th for protesting ICE (Immigration and Customs Enforcement). ICE is functioning as Trump’s personal police force, carrying out his racist agenda and terrorizing families and communities. If you use City resources to prosecute the people who are courageously confronting ICE and Trump, you will be on the wrong side of history. The City of Seattle and your office should instead be focused on doing everything possible to protect our communities from ICE. Today, August 20 at 11:30am, the No New Youth Jail Coalition is holding a rally at the King County Chinook Building in downtown Seattle to demand that the County stop building the jail and court complex and repurpose the site and resources to meet human needs. We are also launching our new report, King County Exposed: The County’s Efforts to Guarantee Youth Incarceration. Dow Constantine says he is committed to ending youth detention, but our public records requests reveal something quite different. The County’s willingness to risk catastrophic budget shortfalls in its efforts to complete the project despite a court ruling that the tax levy that is supposed to pay for it was improper. Read the report and join us at the Chinook Building on today at 11:30am! Brothers James, Jerome, and Joseph Taafulisia are Asian Pacific Islander youth accused of the highly publicized Jungle Shooting. This 2016 shooting in a homeless encampment that ran along a stretch of Interstate 5, was touted as a one of the deadliest in Seattle. The incident has since been used by the city to justify anti-homelessness raids and policies under the pretext of public safety. Although this tragic event happened almost two years ago, the trial is just now underway. Joseph, 13 years old at the time, has already been sentenced to 8 years in juvenile detention. James and Jerome on the other hand, respectively 17 years old and 16 years old when this incident occurred, were charged as adults and are facing a lifetime of imprisonment if found guilty. Amidst the media fanfare, the misfortune of these youth have been conveniently disregarded. James, Jerome and Joseph, all legally children, have been vilified throughout this process and deemed for inevitable incarceration. All to satisfy the illusion that these youths’ lifetime imprisonment could address the rising anxieties around poverty, homelessness, and violence in this increasingly inequitable city. What the general public needs to know is that James, Jerome and Joseph, are the products of the system that is now demonizing them. These three brothers knew violence long before this act was committed. James was 5 years old, Jerome was 4 years old, and Joseph was 6 months old, when they were removed from the care of family members and taken into the custody of the state’s Child Protective Services. The lives of these youths have been tumultuous and full of instability ever since. They have been in and out of foster care, homeless, and exposed to environments and activities no child should ever have to witness or experience. Accordingly, they have had many encounters with the Department of Social and Health Services (DSHS) and the juvenile court system. In fact, at the time of the shooting, these three youth were wards of the state who were living together in a tent on the outskirts of the Jungle. The very system that claimed to support and protect them simply failed. As with many youth of color, the criminal justice system blames the youth for these failings and holds them fully accountable to the extent of criminal law. In contrast, there is no responsibility placed upon the state-sponsored systems that have traumatized and criminalized these youth. How these youth find themselves in such circumstances and the tragedy of the violence they committed, says a lot about who we are as a society. The reality is, James, Jerome and Joseph are neither suspects or the accused, they are victims of a system that routinely and systemically harms youth of color. They are evidence of the ineffectiveness of these court-based jail systems that city leaders support by the allocation of resources. James, Jerome and Joseph are examples of how these systems fail our youth and why we must continue to organize towards finding community-based restorative alternatives. These youth and youth like them, need stable homes, family, community – love and healing, not jails. Indeed the long-term strategy is to advocate for alternative solutions that do not involve the continual jailing of kids. In the meantime, we can show up for these youth or any youth facing judgement from institutions of racism, by supporting them through these traumatizing court proceedings. Keep in mind – we cannot just continue to talk about No New Youth Jail and forget about the youth that are actually being put into these racist institutions. The building is not more important than the youth going into it. Ultimately, just as a community is not a community without the individuals in it, a building is just a hollow space without members of our community in it. Part of our work is to do what is necessary to stop the kidnapping of our youth by these systems to fill these buildings. Too often the defendants in these proceedings stand alone against this system and its proxies. Occupying these courtrooms and holding probation officers, prosecutors, and judges accountable, is one way we can show up as a community. We cannot underestimate the value of our presence. We must bear witness and not allow them to prosecute our community in the name of protecting us. We cannot let public officials continue to use the prison industrial complex as a convenient solution to the issues of public safety. We must fight racism and stand with our youth. Come out and support the youth if you are available. Exact dates, times, and location of James’ and Jerome’s hearings is detailed below. Also, look out for the dates, times, and locations of hearings of other youth in the future. Your support will not only be meaningful to the struggle against racism, but much more meaningful to the youth impacted by racism. James & Jerome Taafulisia: Monday thru Friday, up until August 19th, in Judge’s Cheryl Carey’s, Courtroom #3F, at Maleng Regional Justice Center (RJC), Kent, WA. Trial is ongoing from 9 AM to 2 PM daily. 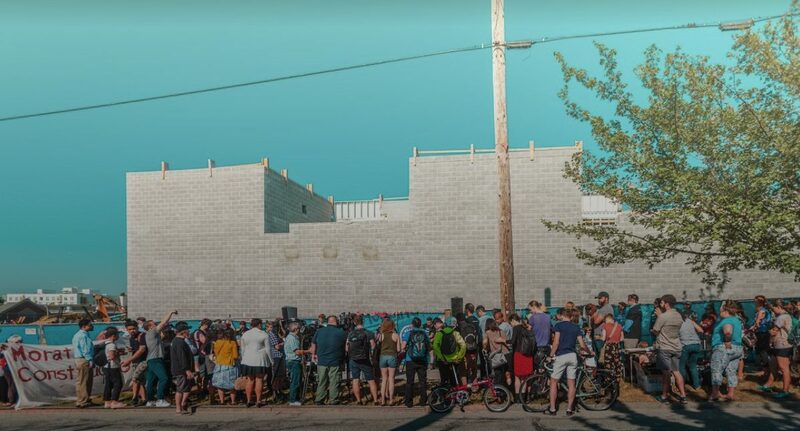 The coalition formed to stop construction of the new county youth jail facility on 12th Ave said Tuesday that Dow Constantine’s officials have warned that the project could be “catastrophic” to county coffers. Nikkita Oliver and the No New Youth Jail and People’s Moratorium efforts held a press conference and rally Tuesday morning to announce the findings outside the fences where construction continues on the $200 million-plus youth justice facility that will create a new incarceration facility, and new court and administrative buildings on the county’s campus at 12th and Alder. “This system is going to traumatize children and separate families,” Oliver said Tuesday. Standing in front of a large, windowless, concrete block wall, it can be hard to imagine work stopping and a re-purposed design taking shape. More than 120 community groups and organizations are calling for the re-start as part of the People’s Moratorium concerning construction of the Child and Family Justice Center. Construction of the county’s controversial project has continued despite a legal decision that thrust a major component of the center’s $200 million-plus budget into question. The new facility is under construction on the same campus as the existing juvenile justice center along 12th Ave about a block south of Seattle University. The county has been looking to replace the courthouse and administrative buildings for years and is building a new jail along with them. The recession of 2008 held up plans for the expensive project, but the county passed a roughly $210 million levy in 2012. CHS reported here on the county’s efforts to show its changing approach to juvenile crime and justice. In 2016, the proportion of black youth in jail decline from 58.5% to 49.9%, county officials say. According to U.S. Census figures, about 7% of the county population is black and another 5% identified a multiracial. King County plans for the new facility to be open by 2020. In September 2017, the Washington Court of Appeals ruled that King County has been unlawfully collecting property taxes for the proposed youth jail, a ruling that effectively eliminates the majority of the funding for the project. County records revealed that one day after the court decision, King County Budget Director, Dwight Dively, emailed officials, stating that, if the County is unsuccessful in the appeal, the project would need to be “paid from the General Fund, resulting in even more financial pressure on other services.” Specifically, the County would be required to issue bonds with an estimated annual debt service of $11.4 million dollars for the next 30 years. Then again, in December 2017, Mr. Dively emailed officials, stating that, a loss could add $50-200 million to the General Fund, and that the “effect is potentially catastrophic.” Click here for Dively’s email. Nevertheless, without any alternative funding source in place, King County continued construction on the $210 million project. Seattle City Council member Mike O’Brien spoke Tuesday against the construction. Other activists drew connections to the fight against the separation of families by federal immigration officials.